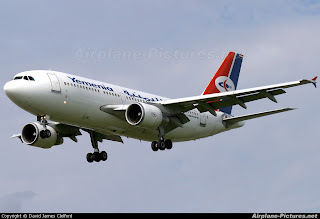 The actual report later in the news noted - correctly (as reported elsewhere) - that the aircraft type involved is an Airbus A310, which is an older plane of completely different design to the A330. The wording of the headline - specifically the reference to "another A330..." and "crashes into the ocean..." - was clearly designed to evoke recall of the tragic Air France AF447 crash in the Atlantic earlier in June. I rang the ABC Radio newsroom immediately (while the bulletin was still running). The person to whom I spoke acknowledged that the headline had been incorrect and agreed with me that it should be corrected. However, five minutes later, the headlines in the "recap" at the end of the news once again made the misleading claim that "another Airbus A330 has crashed into the ocean". OK, I may be a plane-spotting nerd, but this was not merely a matter of having the facts wrong. This was clearly an attempt by someone in ABC News to sensationalise the news by implying this was "yet another" incident involving the A330, regardless of the fact that this crash involves a completely different aircraft type. Furthermore, reports to this point suggest that this crash occurred while the plane was makiing its approach to land in the Comoros, and not (more worryingly and much less explicably) at cruise altitude in mid-flight, as was the case with Air France 447. Given that there are a number of A330s in the Qantas fleet, that kind of misleading and sensationalist reporting has serious implications for Australian consumers.